Hi. Winnie Griggs here. I live in a small town that’s situated near the Red River in Northwest Louisiana. In fact my husband and I own some pasture land that borders on the river itself and the view from the riverbank is fabulous. I wasn't raised here, though, and from time to time I like to look into some of the local history of the area just to learn more about it. One of the things I stumbled on in one of these research forays was an interesting tidbit of Red River History, namely The Great Red River Raft. First off, the raft in question is not a floating platform of the kind Huck Finn poled down the Mississippi River. This raft was a massive logjam, reputed to be the largest ever seen in the US. It was comprised of a series of ‘rafts’ formed by fallen trees and debris that made the Red River virtually unnavigable for hundreds of years. 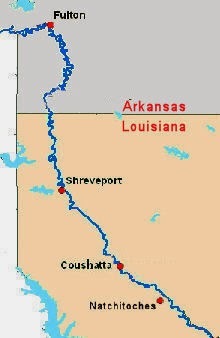 By the start of the nineteenth century, the lower end was about ten miles upstream from Natchitoches, LA (where I went to college incidentally) and from there it extended northward nearly one hundred and fifty miles to the point where the river crosses the Arkansas-Louisiana border. In places it was twenty five feet deep and could be safely crossed by men on horseback. The origins of this logjam are not completely understood. Some believe it began over a thousand years ago when the Red River changed course and moved its end point from the Atchafalaya Basin to join with the Mississippi River. According to this theory, the extreme flood stages of the Mississippi would force large amounts of debris back into the Red during the heavy rains that fell every spring. Once enough had backed up to cause the first major logjam, the obstruction began to build upon itself, growing on the back end faster than the front end eroded. Another theory is that the logjam was formed as the swirling waters eroded the river banks, toppling huge trees at the river’s edge that submerged and began to trap other debris in a cumulative effect that eventually resulted in the massive rafts. Regardless of the cause, by the time Fort Towson was established in what was to become Oklahoma, and Fort Jessup was established to protect western Louisiana, it became critical to open up the river to navigation as a means of getting supplies to these garrisons. Several ideas were put forth, most of them entirely impractical. Finally, in 1825, the Arkansas territorial legislature petitioned the U.S. Congress to handle the situation. As happens today, Congress decided to first study the matter, so it was 1832 before a solution was settled on and the funds were appropriated to actually begin the work. The project was stopped several times as funds ran out and new monies had to be appropriated, but by March of 1838 Shreve had succeeded in clearing the channel. 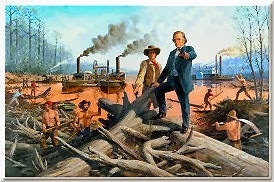 So impressed were the locals with the work of Captain Shreve and his crew that when, in 1836, entrepreneurs incorporated a new town on the banks of the Red, they named it Shreveport in his honor. Captain Shreve cautioned Congress that keeping the channel clear would be an ongoing effort. Congress chose to ignore his warning, though, and by 1839 the raft had begun to reform. During the next 32 years the government spent upwards of $630,000 funding various schemes to reclear and maintain the channel, most of which met little or no success. Finally, in the spring of 1872, Lt. E. August Woodruff, head of the Army Corps of Engineers, began a major attack on the raft. Combining Shreve’s snag boats with saw boats, crane boats and explosives, he had success within a year. In May of 1873, the 150 foot steamer R. T. Bryarly, fully laden with cargo, arrived in Shreveport – it was the first such ship to do so in 29 years. This time, learning from prior mistakes, Congress appropriated the funds to allow for patroling the river with vessels that could keep the raft from reforming. Finally, by 1900, the great Red River raft was permanently defeated and the Red River was open to navigation from Indian territory all the way to the Mississippi. So there you have it, the story of the Great Red River Raft. So glad u enjoyed the post! I'd never heard this tale before, Winnie. I've crossed the Red River many times, going into Texas and back to OK. I'll probably think of this story next time I travel over the Red River. Very interesting! Very interesting information, Winnie. Thanks for sharing. Jennifer, you're quite welcome. Glad you enjoyed he post.